As a large number of students finds their way to Spekul each year, we put a lot of effort into training those new members. As a general rule, training sessions in SRT techniques are organized on a weekly basis during the academic year on Wednesday evenings from 8 pm until 10 pm in the training facilities in our club house (see 'contact us'). A new series of lessons starts every semester, but as we strive to have as many one-on-one lessons as possible, you can start at any time. Places are limited, especially at the start of each semester, so it pays off to be on time. To be allowed to join these trainings, you need to have a 'sportkaart' or a 'dagkaart' of the 'sportkot'. You don't need to bring any material for these lessons, but make sure you're wearing loose clothing and an old t-shirt. 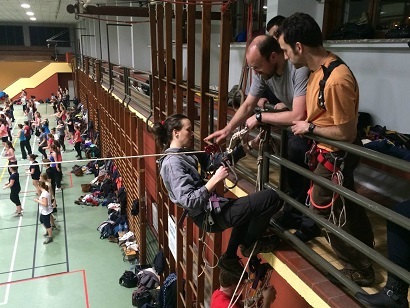 During the lessons, you will learn the basic techniques required to negotiate ropes in caves: descending and ascending, passing fractions, deviations and knots, passing traversées, tyroliennes, hors-crues and a lot more. A few times a year there are lessons about knots. Of course, you can only really learn to cave under the ground! 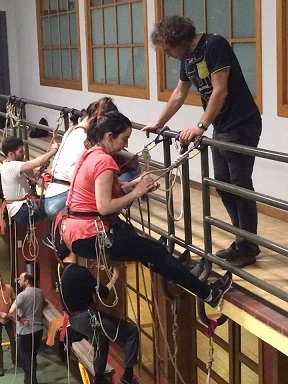 Each semester we try to organize trips to 'easy' caves so that new members can practice their rope techniques. If you want to join these trips, pass by in the club house! The rules for the trainings can be found here (Flemish). For more information, you can always send an email to .